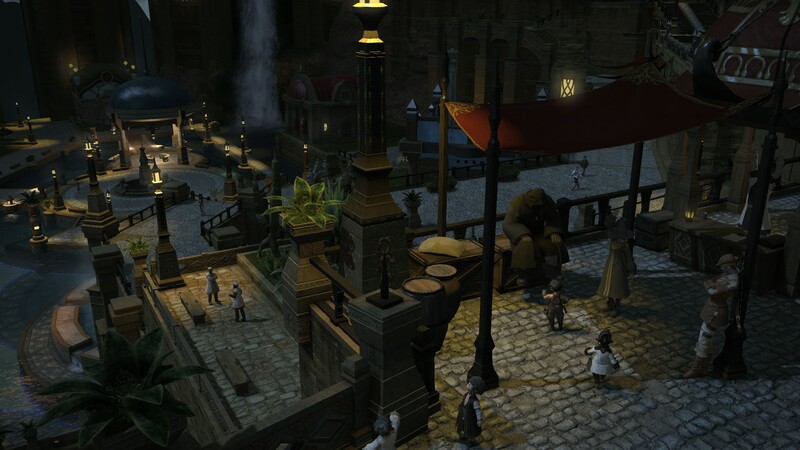 Originally, gods interacted with mortals on a regular occurrence – But the First Umbral Era put an end to that. 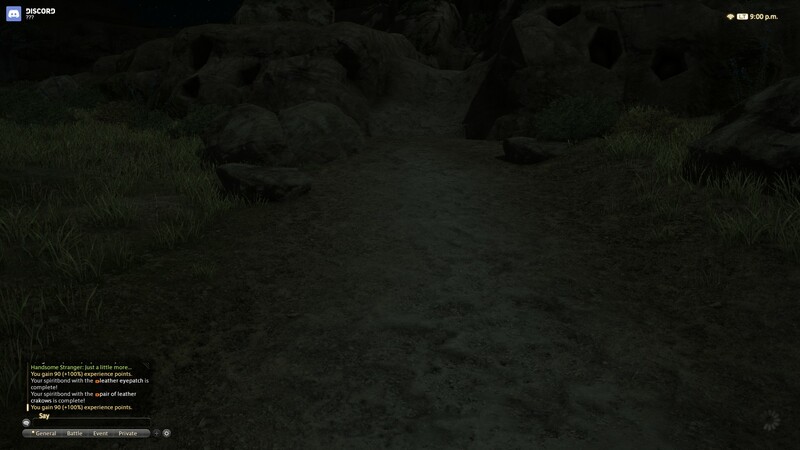 Umbral Eras are often chaotic in nature; dangerous. 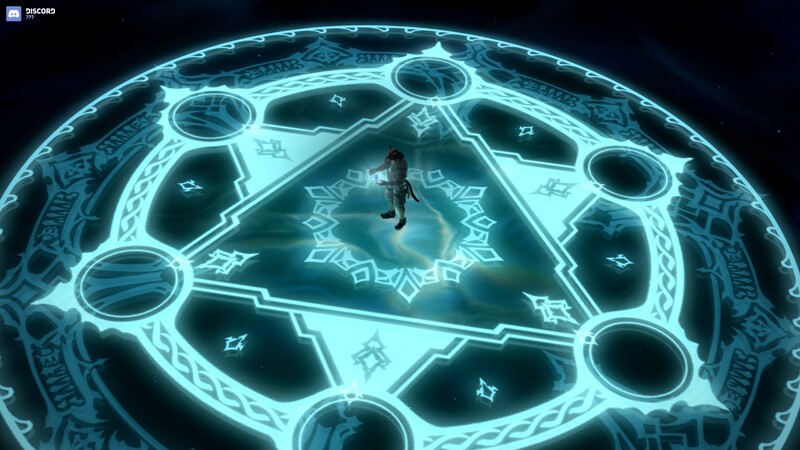 But then, after Umbral Eras come Astral Eras, giving time to reflect and build again. Whilst the Umbral represents chaos, the Astral represents order. 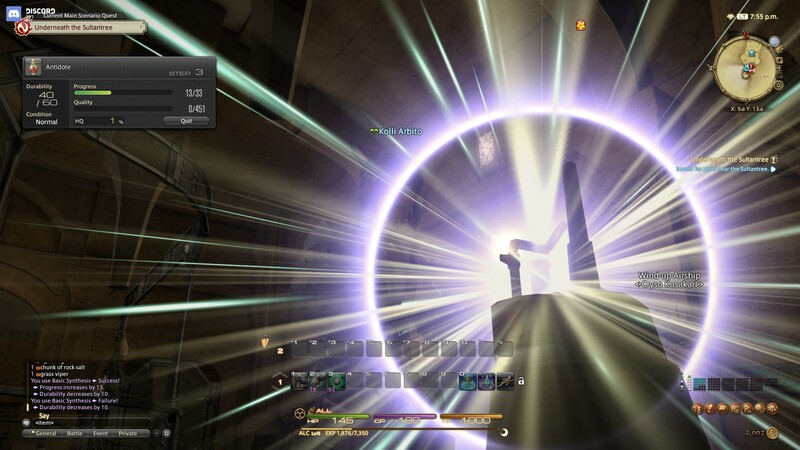 The player character is travelling to his/her starting city (Gridania, Limsa Lominsa or Ul’dah), when they have these visions of a blade of light striking down a masked man. 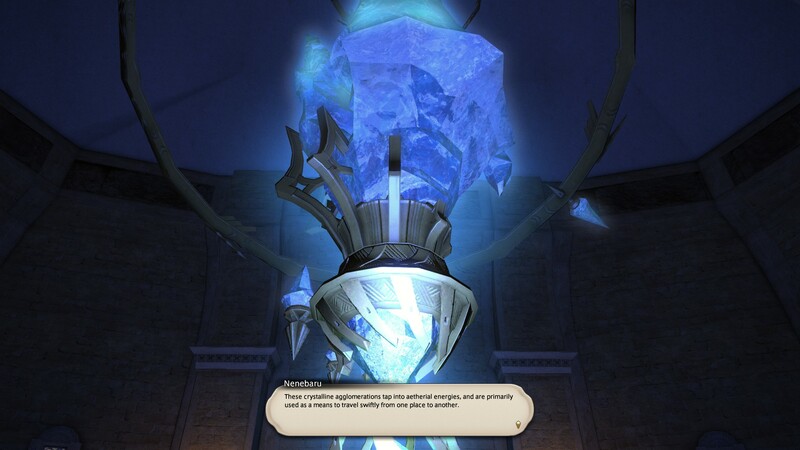 When they arrive in their starting city, through conducting their day to day life as an adventurer in Hydaelyn, they are eventually revealed to be the chosen representative of Hydaelyn, the Mothercrystal. 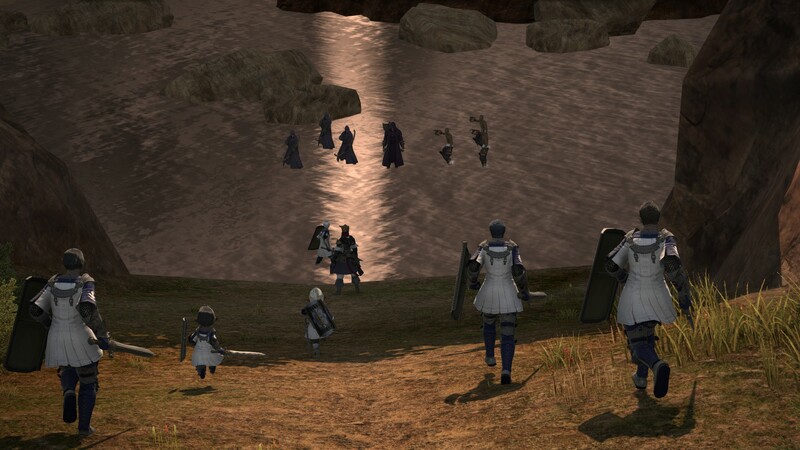 Secret plots, relatively unknown organisations and much more await the adventurer in Final Fantasy XIV: A Realm Reborn. 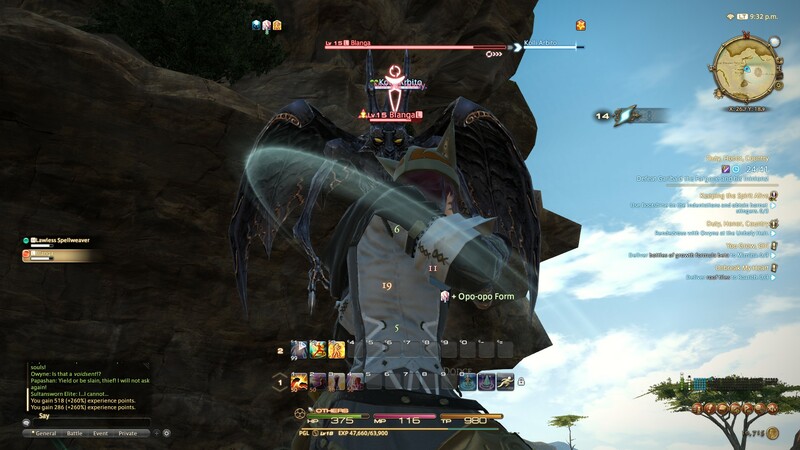 Many of you are aware about how an MMORPG works, however we’ll go over the basics of MMORPGs and I’ll finish this section off with a summary about what differentiates FFXIV: A Realm Reborn from others in the genre. 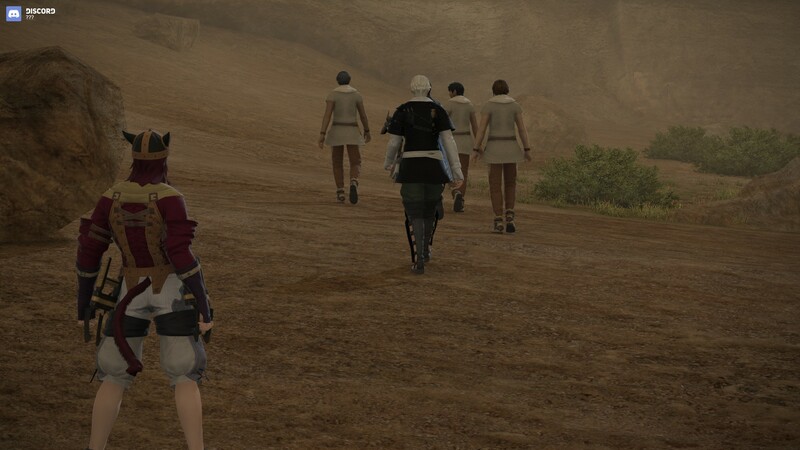 You start the game by creating a character, of which you have five to choose from, but a sixth isn’t available in the trial. As such, I chose one that fit my personality to a tee. 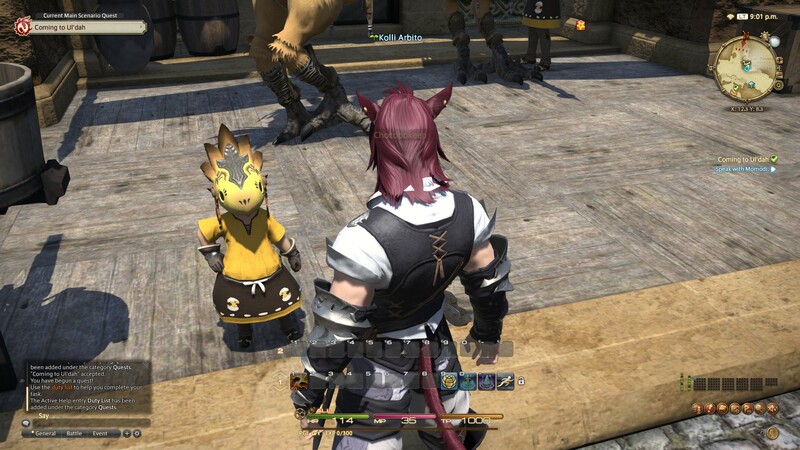 Since the rest of the damn universe seems to enjoy playing as a Lalafel, the cute little beasties that they are, I chose the actual beast race, the Miqo’te. A cat person. With cute, fluffy cat ears and a cat tail. Purr-fect. Once you’ve chosen a race, you get to choose your class, which stretches you into one of two categories: Disciple of War or Disciple of Magic. 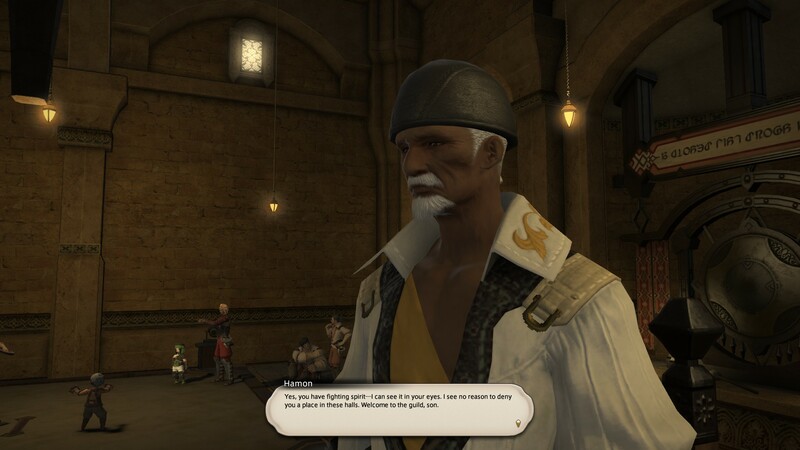 I chose to be a Pugilist, which means I am all about punching my way through a problem. 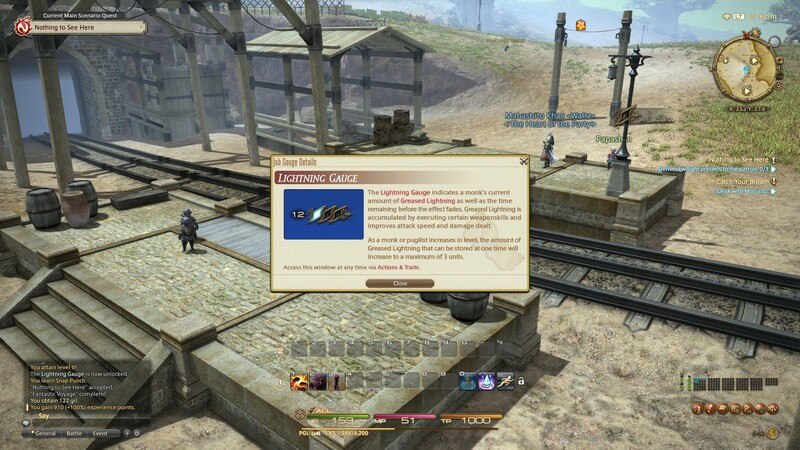 It’s a Damage Per Second (DPS) specialised class, which I figured would be best for levelling. The damage is low, however the speed of hits are rather high, making me get through enemies relatively quickly. Once I was settled on a name, Kolli Arbito, I got into the server for the first time and… I was met with a very pretty world! Movement is as you’d expect with a mouse and keyboard (MKB), however you can also use a controller with the game by default, which is a nice touch. I have some friends who use controller, as opposed to MKB. You control the camera with the mouse, you move with the keyboard (or mouse, should you choose to), including auto-run by pressing the middle mouse button. 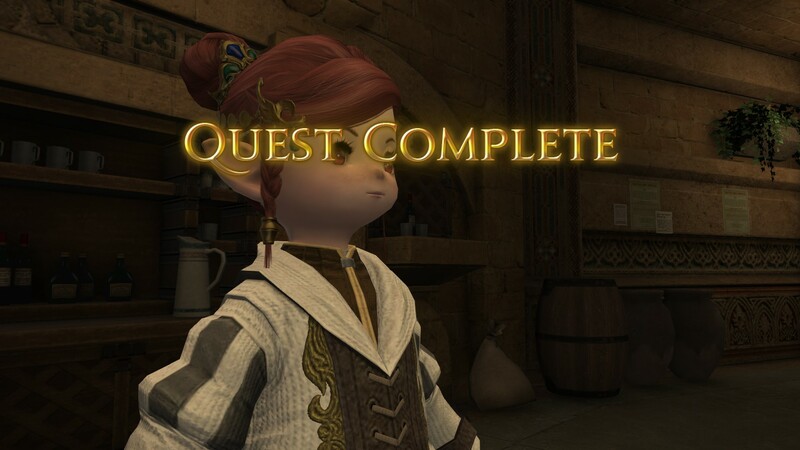 As you progress in levels, you unlock more quests relating to your class. These will give you more skills, as well as a better understanding on how your class is supposed to play out. 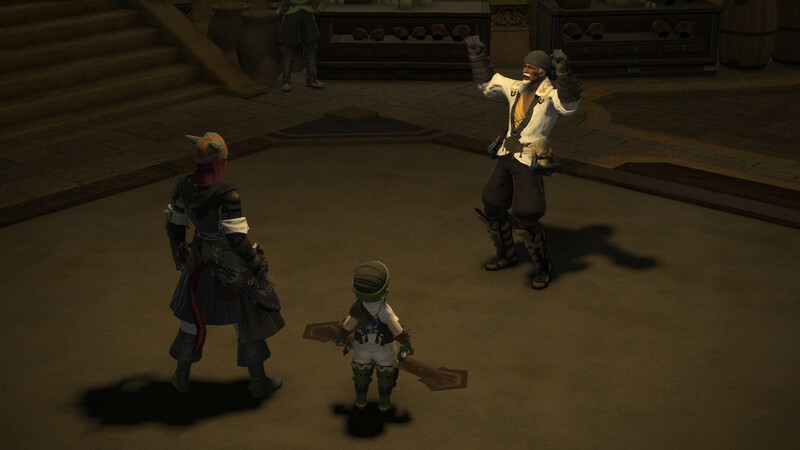 As a Pugilist, I will eventually become a Monk. 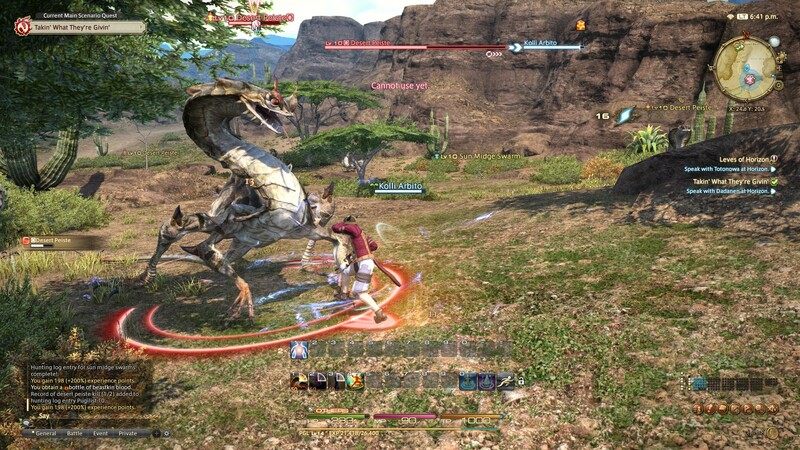 As such, positioning is hugely important for getting the best damage output for the character, so I’m strifing a lot in combat. 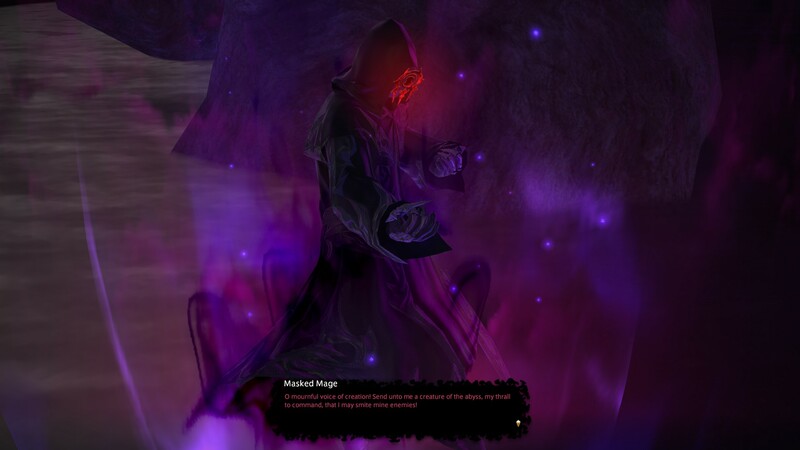 Other characters, namely casters, might be more stationary so they can cast their spells. Combat is a case of running up to an enemy, right clicking on them and rushing in to smack them around a bit with my abilities. 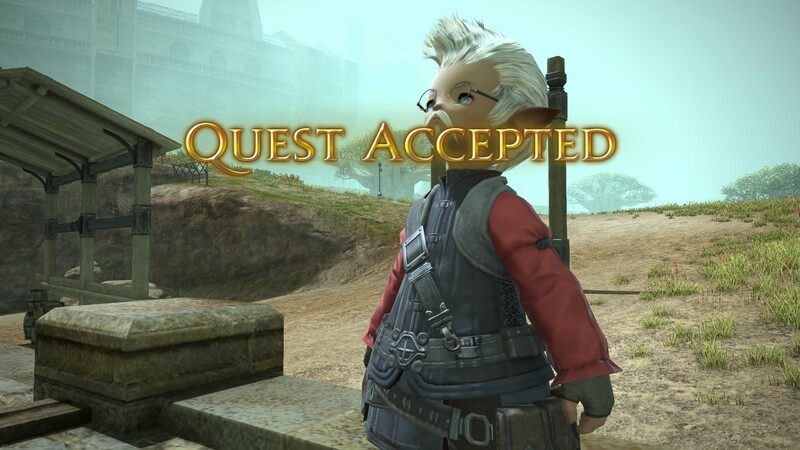 As you kill enemies, you earn experience and after some early quests, you unlock a “Hunter’s Log”, which effectively gives you an experience boost for killing a small number of the same enemy. I really like the Hunter’s Log – I think it’s a great touch. 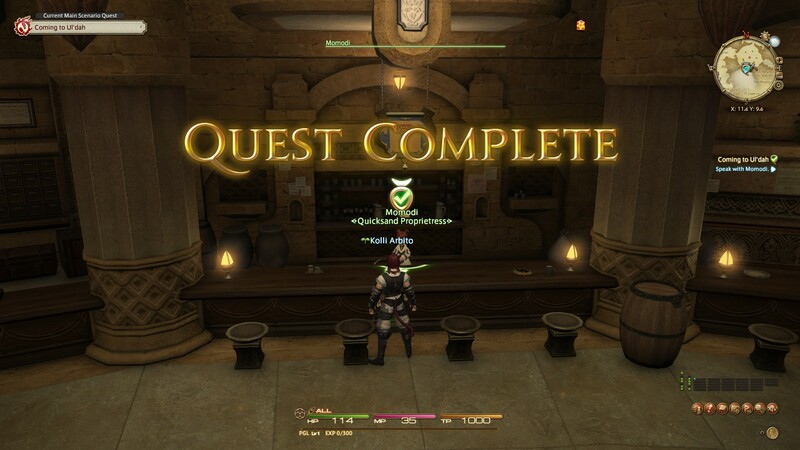 By completing quests, you earn more experience – But you can also find a FATE, which is effectively an event which happens in specific locations. These FATEs can be completed, granting you a big boost in experience. 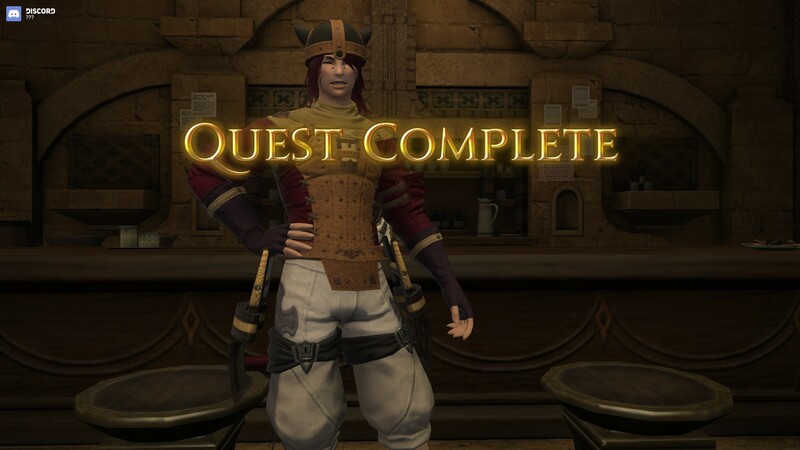 It’s possible to level up entirely on FATEs, however as far as I’m aware, these have somewhat died down since the introduction of the new expansion introduced this year. 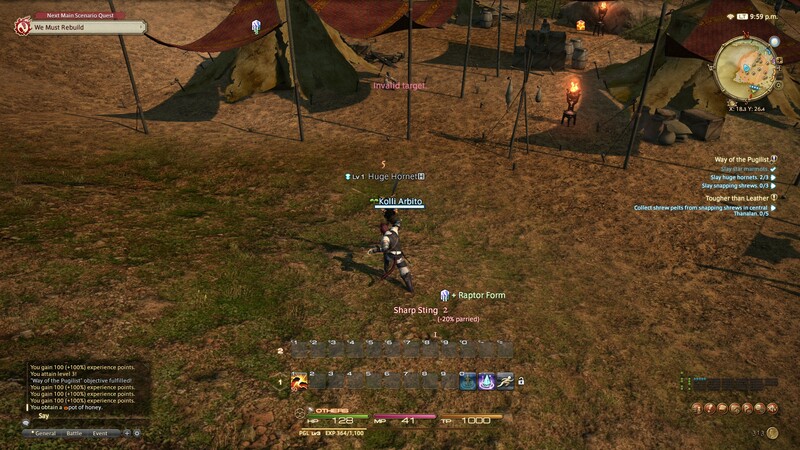 Overall, the game plays like your standard MMO, with a few key differences. First of which we’ll talk about the class system – You can change your damn class! 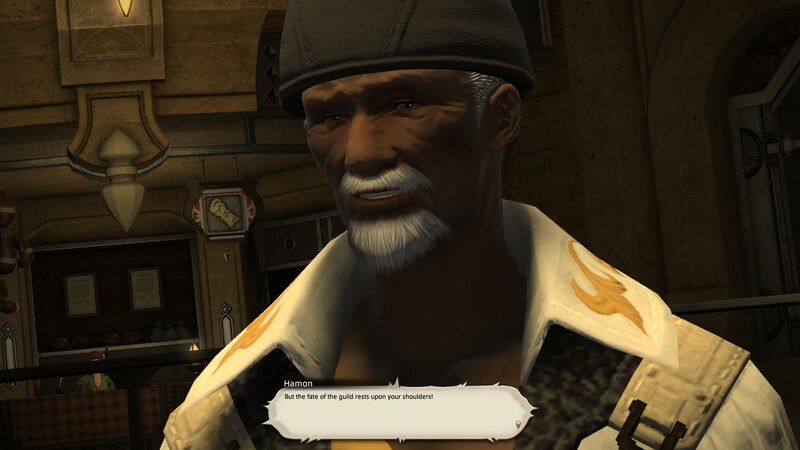 Now, bearing in mind that it considers a profession a “class” as well, you can go between, for instance, a Pugilist and an Alchemist. 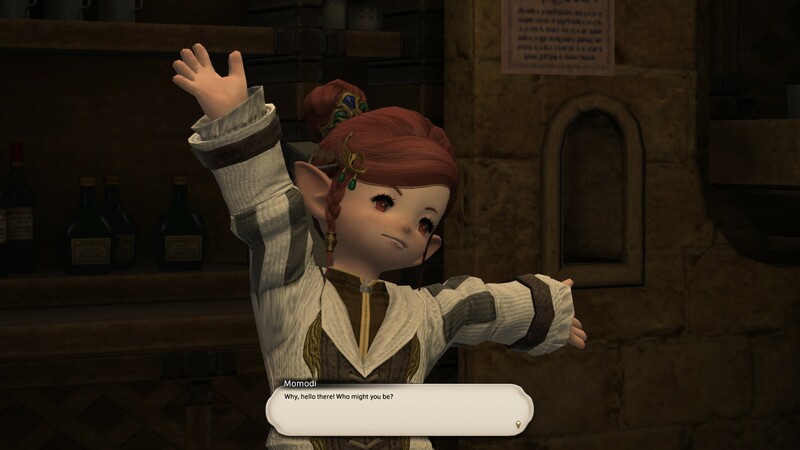 You can, technically, have many classes on one character; effectively eliminating the need for multiple characters Pretty strange, but considering the classes are what determines the starting area, it’s not too surprising. 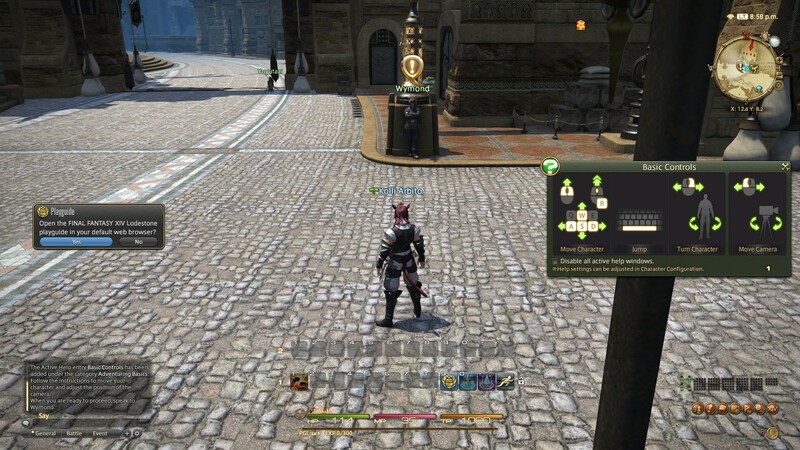 Next up, you can play “mini-games”, which you unlock throughout the game. As far as I’m aware, there’s a version of one of Final Fantasy’s many card games in this (Triple Triad). There are other mini-games available. 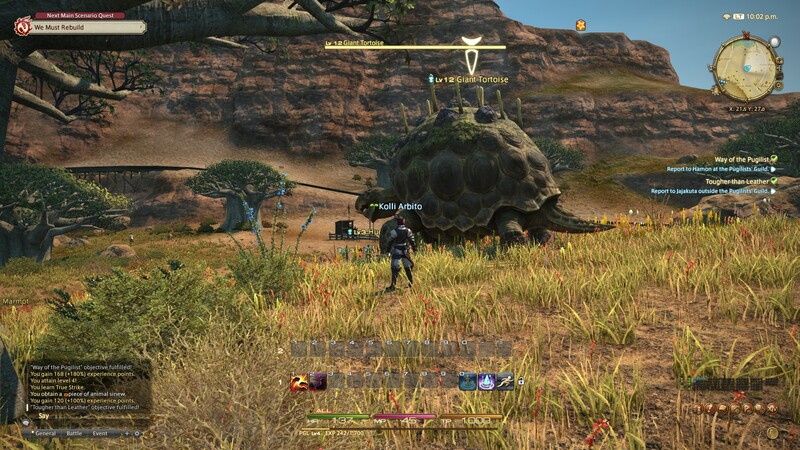 Along with mini-games, a similarity to other MMOs are the introduction of mini-pets, which are effectively a purely cosmetic addition to your character. They’re incredibly cute! 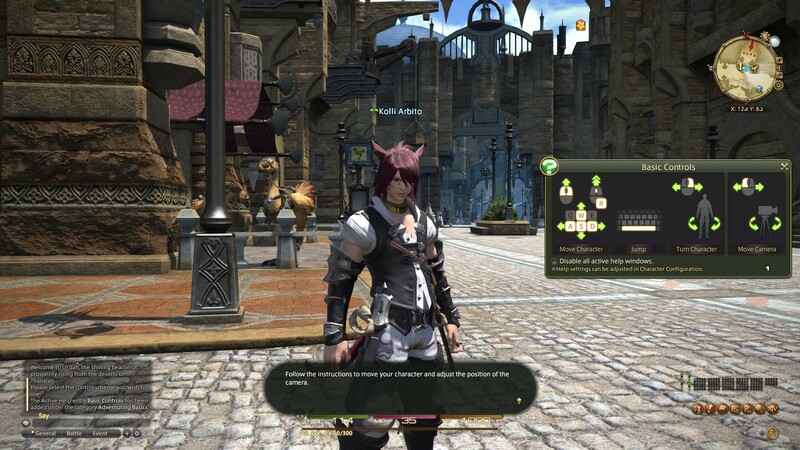 Another distinctive feature, as well as the FATE system, is the armoury system. 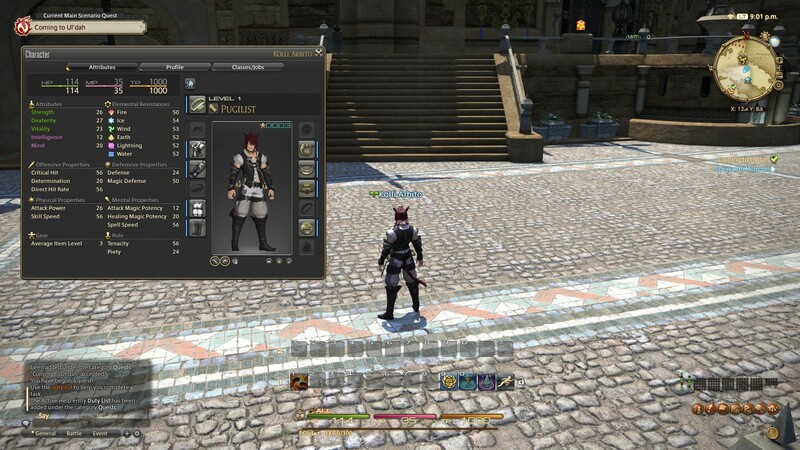 If you want lots of equipment which you swap between, you can set an “equipment set” by wearing it and then pressing the new button for sets. 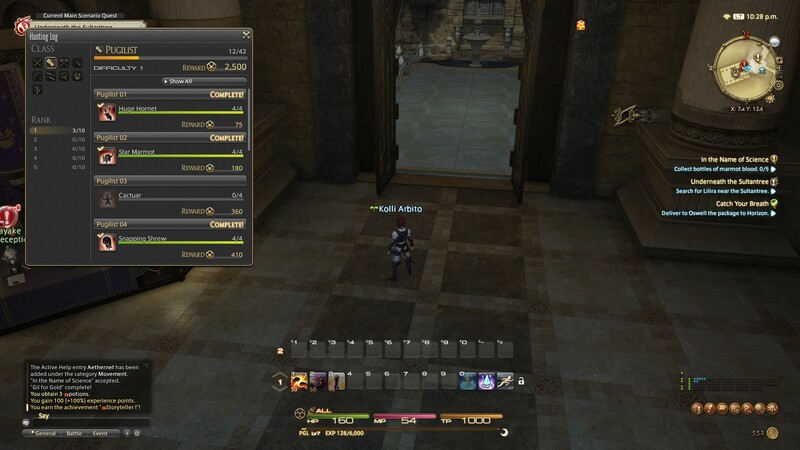 Your equipment doesn’t take up your inventory space, either – Instead it is added to a separate “armoury” inventory. Further to this, you get a huge amount of bag space from the get go, so go collect everything! Finally, as a fascinating point, remember I mentioned you go between classes/jobs? You level them all separately. 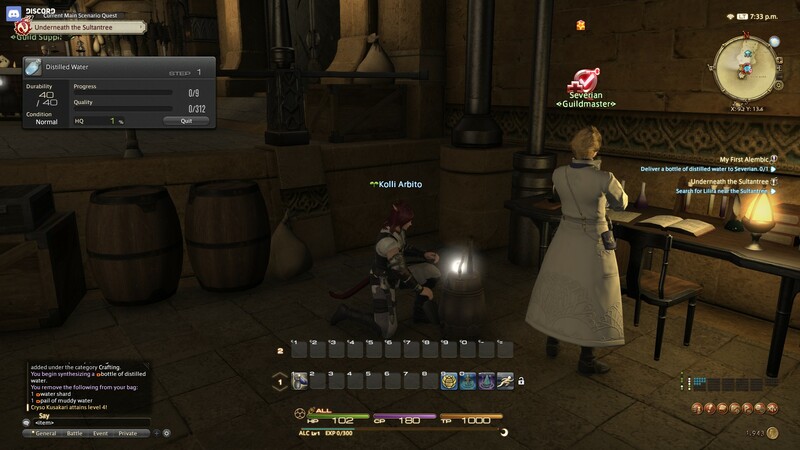 Now, normally, in an MMO, you’d have a profession which you level up as you’re in towns, or running around – In this, you need to equip the weapon relating to that class. For instance, fist weapons for a Pugilist, or a pickaxe for a Miner and so on. 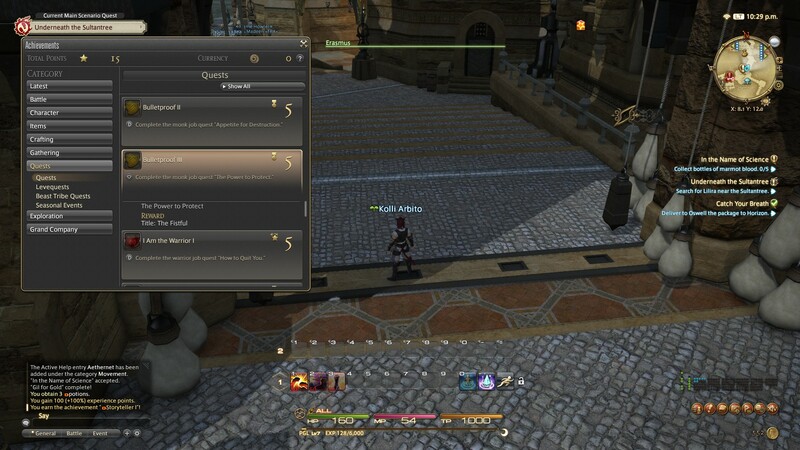 It’s a clever system, which, combined with daily ‘Guildleve’ quests, can be done pretty simply and quickly. I like it! 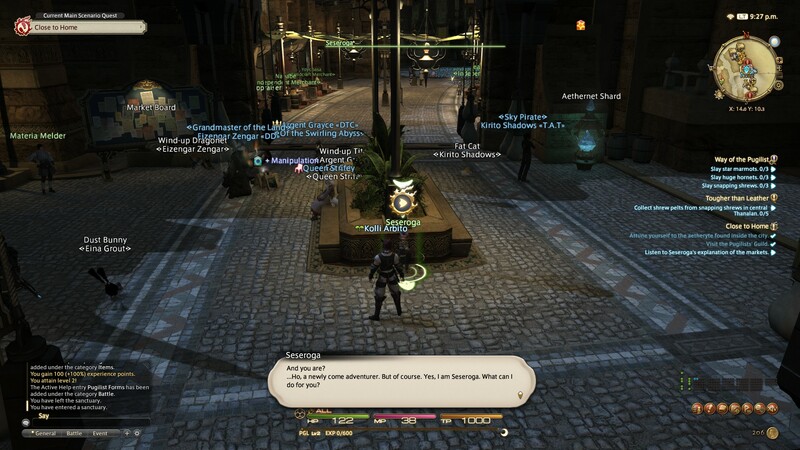 I also like how every class/job has a guild, meaning that you have to register with the guild to get into that role. 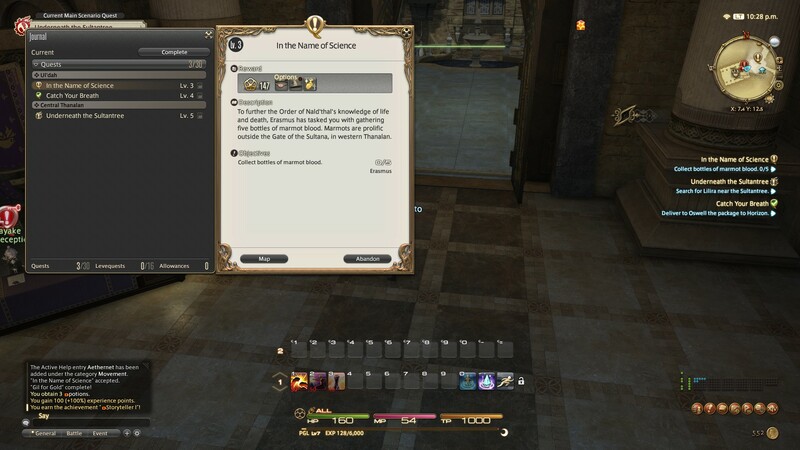 You can, if you so want, play the entire game to 70 as an Alchemist, rather than as a combative class. 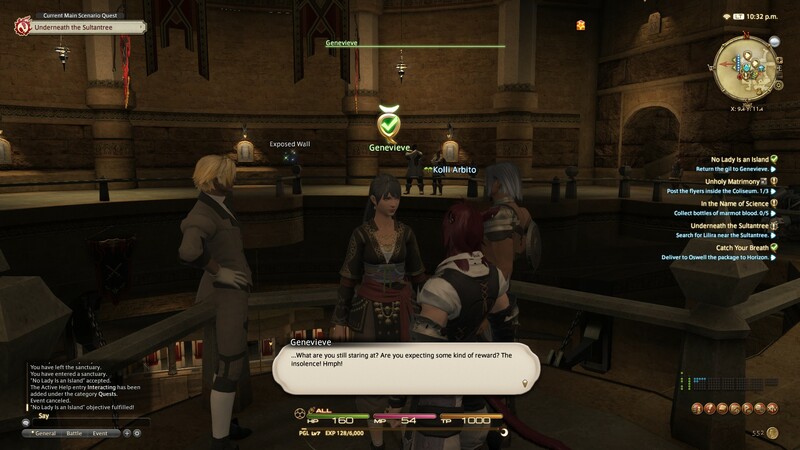 Weirdly, this is the first time I’m ever going to say this about a Final Fantasy game – I don’t like the music! It’s far too samey. I decided to play through for a whole night with the music on and my word, was it ever dull? 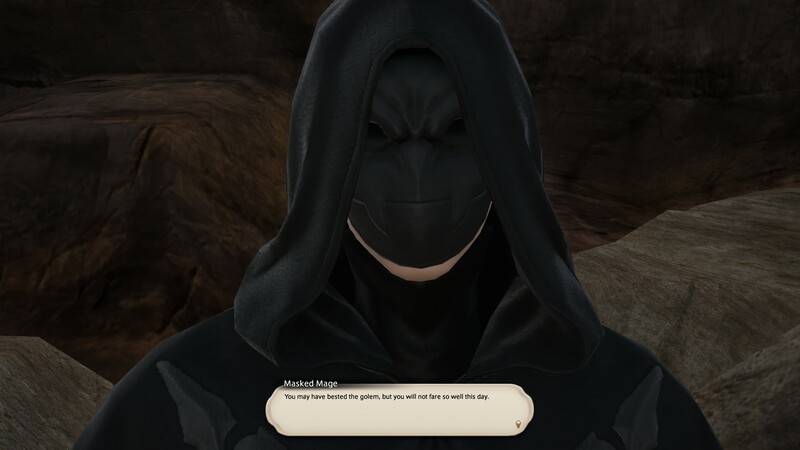 Instead, I opt to turn the music off and listen to my own Spotify playlist of other Final Fantasy tracks, because this is a rare example of Square Enix being off course on their audio. Having said that, the sound effects are pretty good. 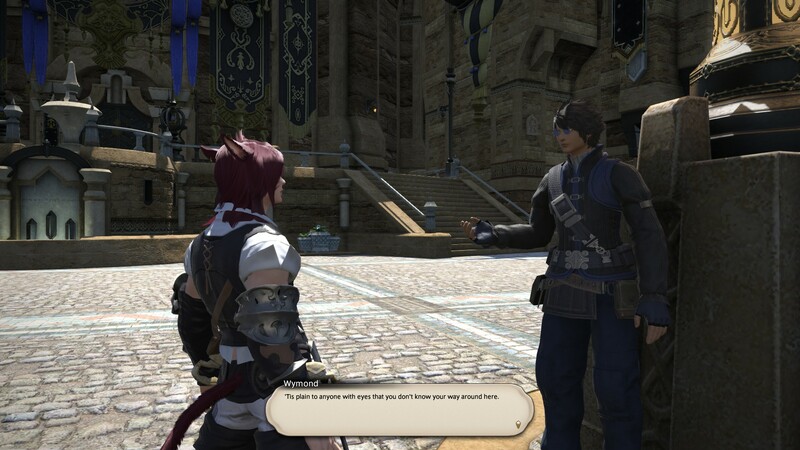 You get a good range of voices during character customisation, which is nice! Overall, with the background music off, but sound effects on and Spotify playing, it’s actually not a bad experience. 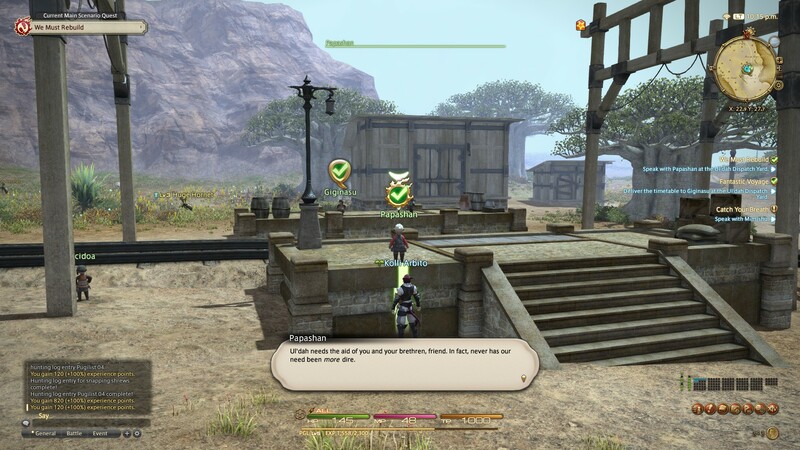 Final Fantasy XIV: A Realm Reborn is a wonderfully mastered title, with lots to offer (especially for those who are new to MMORPGs). However, for me, it missed some of the magic of World of Warcraft and I couldn’t put my finger on why, until very recently. As you look over the gallery, you’ll notice the enormity of everything; which is fantastic… Except for the fact that the character is very literally a grain of sand in massive sandbox. I think the fact the camera goes so far back is strange, but when close up, the camera never feels right for me. Camera placement is a huge issue in games, however it’s not enough to put me off the game as a whole. I’m going to keep going until I’m level 35 – and then I’ll consider the price point. At £9.99 monthly, it’s not a cheap investment; However with World of Warcraft now at £9.99 a month as well, it’s a case of thinking: Do you back Blizzard Entertainment, or do you back Square Enix? All I know is: I’ve enjoyed my time, but for me World of Warcraft was a little bit better. 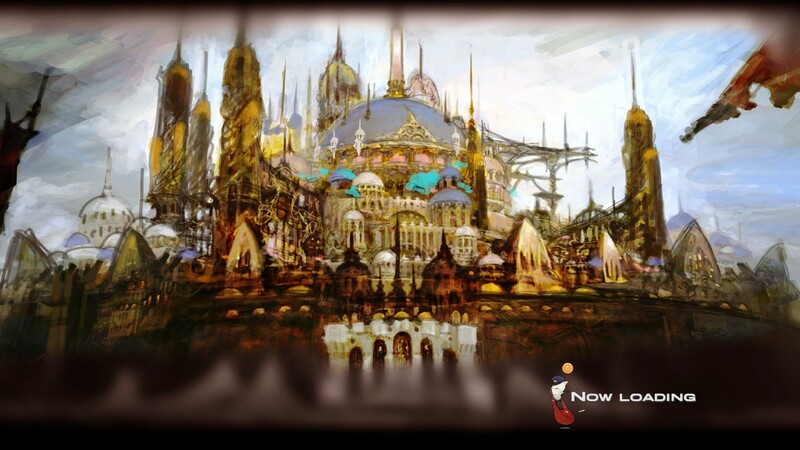 The fantasy felt more present in WoW and it felt like being hit had more consequence. 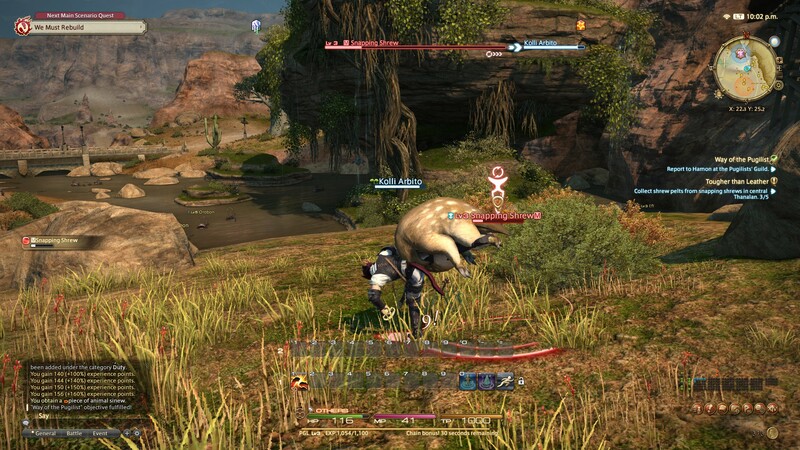 In FFXIV: A Realm Reborn, it doesn’t feel so consequential. But now I invite you to share your thoughts and opinions – Am I right in the lack of consequence? 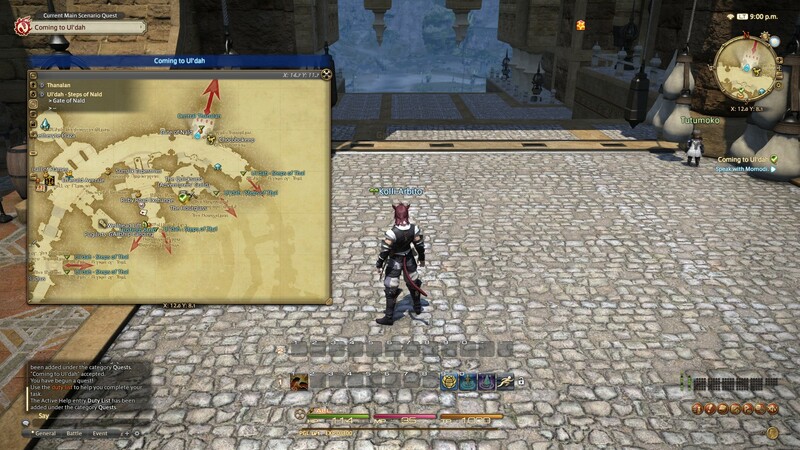 Do you feel being hit is clear enough in FFXIV, or is the placement of the UI a bit strange? Do the camera angles work for you? As ever, leave a comment below, or over on Facebook or Twitter. This entry was posted on December 5, 2017 by Timlah. 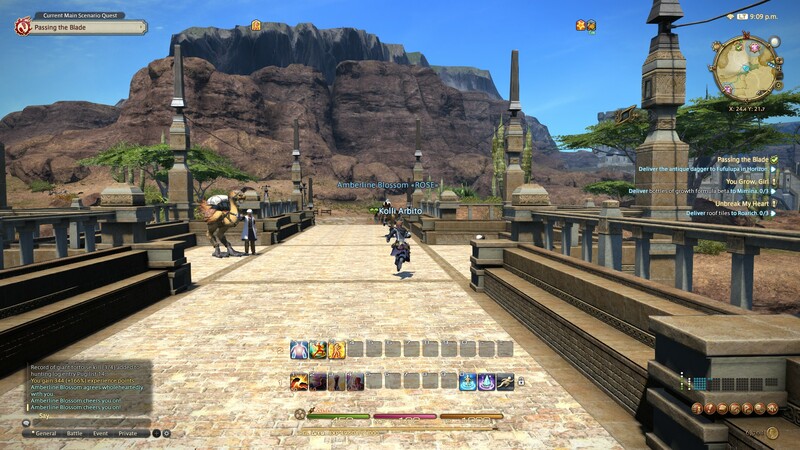 It was filed under Gaming posts, Reviews, Video Games and was tagged with A Realm Reborn, FF14, FFXIV, Final Fantasy 14, Final Fantasy XIV A Realm Reborn, Free Trial, Gameplay, Level 35 FFXIV, MMO, MMORPG, Review, RPG.